Today's TV Trip Encore is dedicated to Leonard Nimoy, a.k.a. Spock. In our hearts you will always Live Long and Pawsper. WAFFLES: Make it GO, Boss! 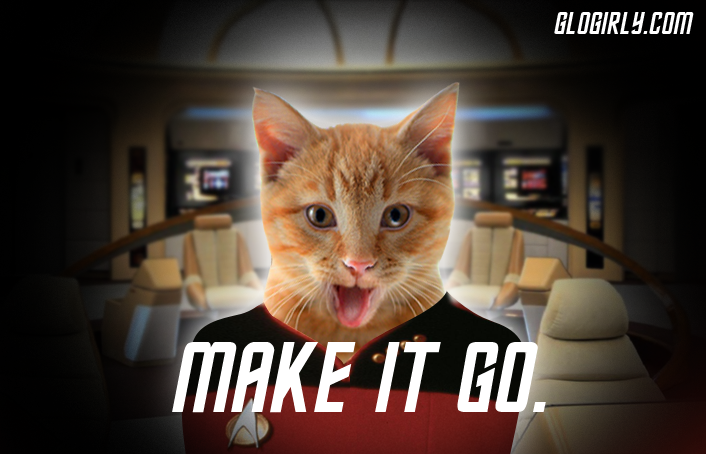 Make it GO! KATIE: SO, Waffles. The line is, "Make it SO." WAFFLES: SO... Make it GO! KATIE: Waffles, even if you COULD get the line right, you're hardly a Captain Picard. WAFFLES: Awe, c'mon Boss! You ALWAYS get to be the captain and stuff. Remember Gilligan's Island? And the Love Boat? Why can't I be the captain? 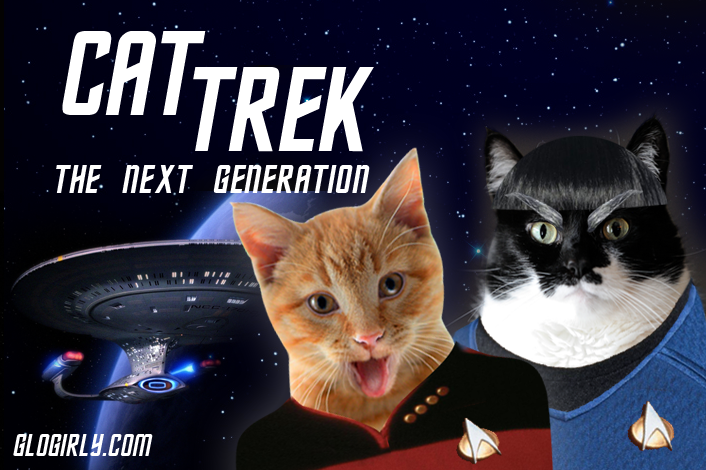 WAFFLES: Isn't this show called Cat Trek: The NEXT Generation? Aren't I the NEXT Generation? KATIE: Waffles, that's what scares me. Young cats today... you have no idea what it was like before Hulu and Netflix. WAFFLES: You mean like when there were dinosaurs no one had iPads and stuff? How did they watch their shows? KATIE: Just hurry up and pose for the title photo. 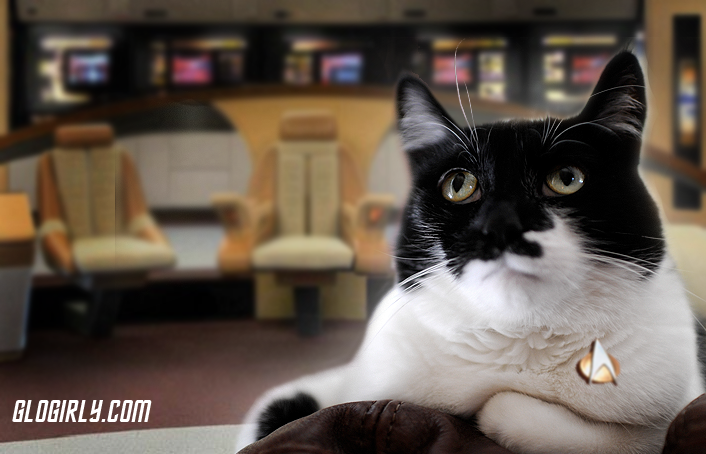 WAFFLES: Only if I can be the captain. So, can I be the captain? KATIE: This is highly illogical. But fine, be the captain already. Catch up on all of our latest TV & movie spoofs. Click the graphic for More TV Trips and hover over it for a surprise! Just Wonderful! We'll miss Leonard Nimoy. What an awesome tribute to a great human and a cool TV show. I was so sad when I heard - this show was something I shared with my mother. Would you believe I've never watched anything Star Trek??? Love your sweet tribute though. Love the tribute, and love Vulcan Katie. I'll bet she would have given Spock a run for the money. 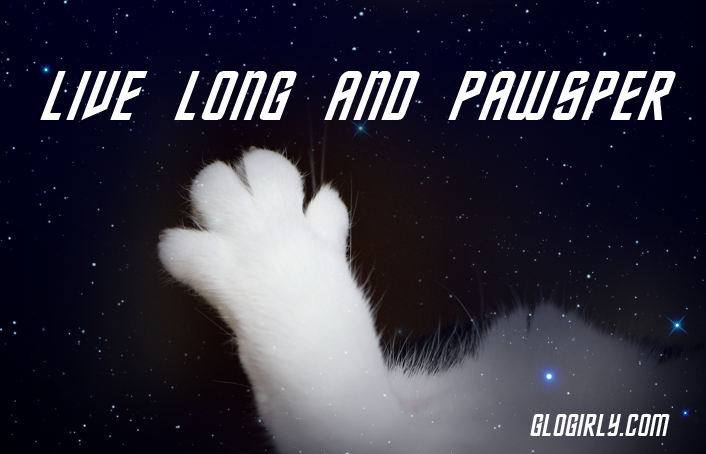 Katie, you are the catification of Mr Spock!! You're so logical!! We love the tribute! Great wig Katie! We bet you wished you could make Waffles go!!! What a beautiful tribute. We loved Dr. Spock. POL. Wonderful tribute! I was worried Waffles was going to have the bald Captain Jean-Luc Picard look but then I remembered Mr. Spock wasn't in the Next Generation. Sometimes Katie, you are better off giving in to the idea. You are still Number 1 Captain in our book anyway. 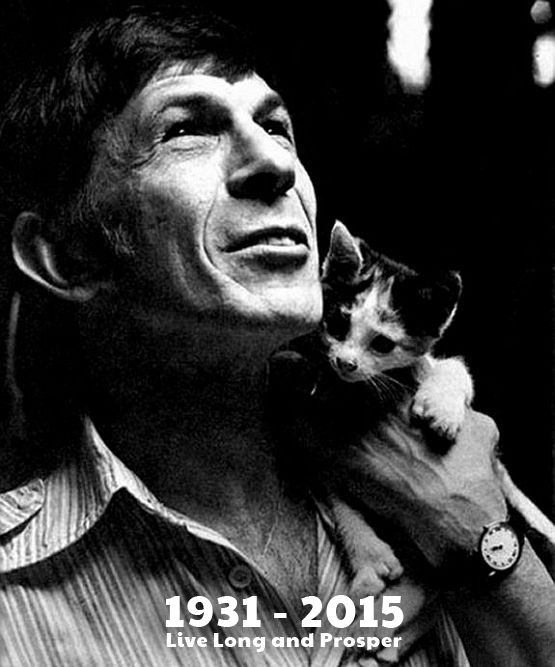 A very lovely tribute to Leonard Nimoy who shall be missed. A Life is like a garden. That is a lovely tribute to Leonard Nimoy. You make a good Spock Katie. Great tribute to Mr. Spock. Awww. That last photo got me in tears again. This is so hard. He was such great man, a trasure to our generation and he is irreplaceable. Vewy cute. Mommy luvved da owiginal star trek wiff spock and kirk in it. Gweat twibute. Love that last pic. We never saw him with a kitten before! But our mom was a lifelong fan (and was too excited when he did a TV spot for us lo those many years back, MOL!). Would you believe that my mom-person never watched any Star Trek episode in her whole looong life ??? Your tribute is very cute ! Most excellent tribute for an icon! And Katie yous looks marvelous darling! What a great tribute. We watched The Wrath of Khan last night here. Never watched the show but appreciate what an icon he was. Not unlike Waffles. What a beautiful post. You guys have big hearts.